The dining room is a place where we spend time with our family members and have a healthy conversation before the day begins and after it ends. Dining room décor thus has a great influence on our moods. Given below are some fabulous and inspiring ideas to create a beautiful dining room and convert your daily and boring eating schedule into a fun and enjoyable experience. Perfect lighting is the key to celebrate the aura and freshness of the dining area. To create the best mood for a special dining occasion, you can choose from an array of decorative items like hanging pendants, beautiful shades, etc. 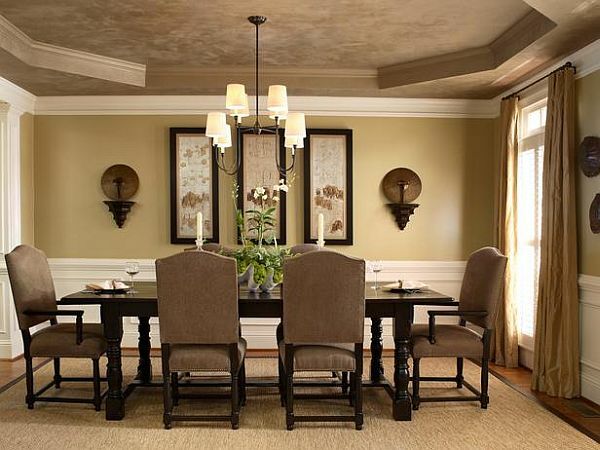 Cover your dining room walls with bold and classic shades like rich blues, dark grays, bright greens and fresh pinks. 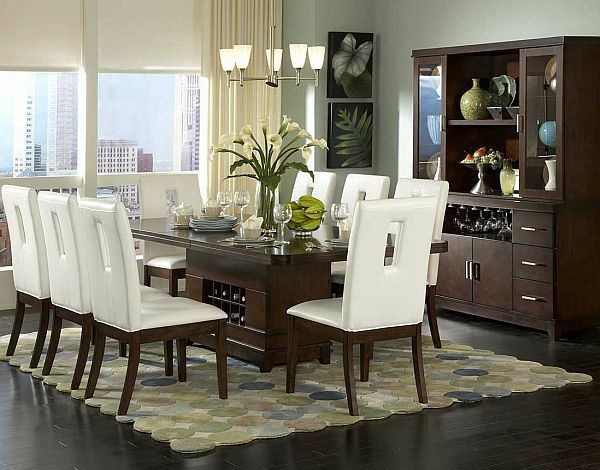 These colors will beautifully complement both the traditional as well as contemporary dining room designs. Contemporarily designed dining areas have gained immense popularity and are simply perfect for organizing parties and throwing get-togethers. For organizing parties, you can add a contemporary appeal to the dining area by using some sculptural shaped chairs. On the other hand, you can try using vibrant wallpaper for the walls of the dining room. It looks beautiful when used with rustic wooden dining furniture. For kitchens with a white theme, a few neon colored chairs will really work wonders and make the place extremely beautiful. Nature inspired decoration is the best that catches the attention of viewers and guests. To bring inside a rustic feel, you can make use of natural materials and wooden furniture and accessories like tables and chairs that add an earthy texture and a distinct modernity to the space. This is a perfect blend of the old and the modern looks. To add oomph and glamour, install terracotta tiles and a copper pendant light. 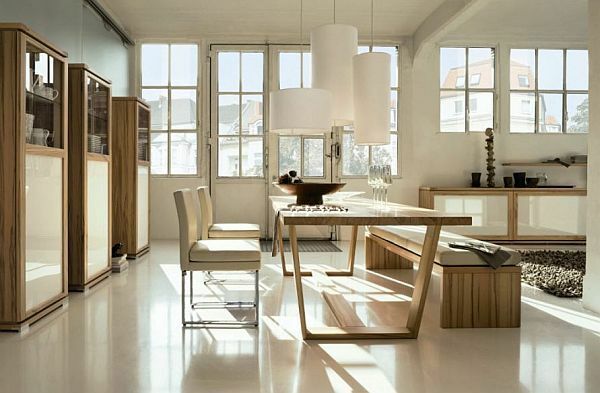 The storage area of small spaces can be increased by adding a few wooden benches along with a trendy table. Although it may seem a difficult task, adding a hint of color to brighten up the dining area can be very simple, if you use some creative ideas. Whether it is an all white dining room or the one with a contemporary country style, bright and flashy wallpaper teamed up with mismatched crockery and offbeat dining chairs in colors like red and green will instantly lift up the style and appeal of the dining room. 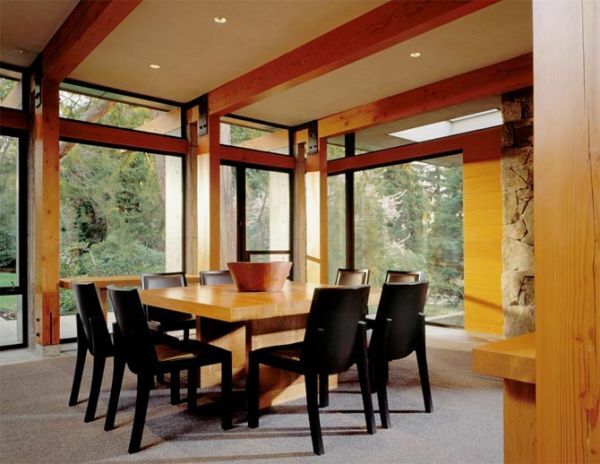 Dining room floors are also important from designing and decoration point of view. Choose a subtle shade, such as black, which looks simply awesome against white walls and rustic wooden furniture thus, creating an eye inspiring contrast. Also, paint the open shelves and walls of the kitchen in the same shade to enhance the visual appeal of the kitchen and to make it appear larger. Patterned black wallpaper with the black floors and metallic chairs will further add beauty to the entire place. Although white is the best choice for painting any room of the house, the use of this shade might sometimes add dullness and boredom. Hence, to get rid of this problem, you should try introducing some shades like bright pink and soft muted shades with sizzling fuchsia chairs to add romance and affection to the eating session. To keep the room fresh and alive, add a vase filled with fresh flowers in a corner of the dining area. With these tips and ideas, decorating your dining area is going to be real fun and an exciting job that would bring beauty and sophistication to your dining room and allow you to have a great time with family and friends. Paper landscapes: An unbeatable creation!